Have you ever thought about showing in Arabian Native Costume? You should! It’s a fun and energetic class! So why should California Arabian Costumes figure into your choices? First, we are one of the oldest and most well established costume company in the Arabian industry today. 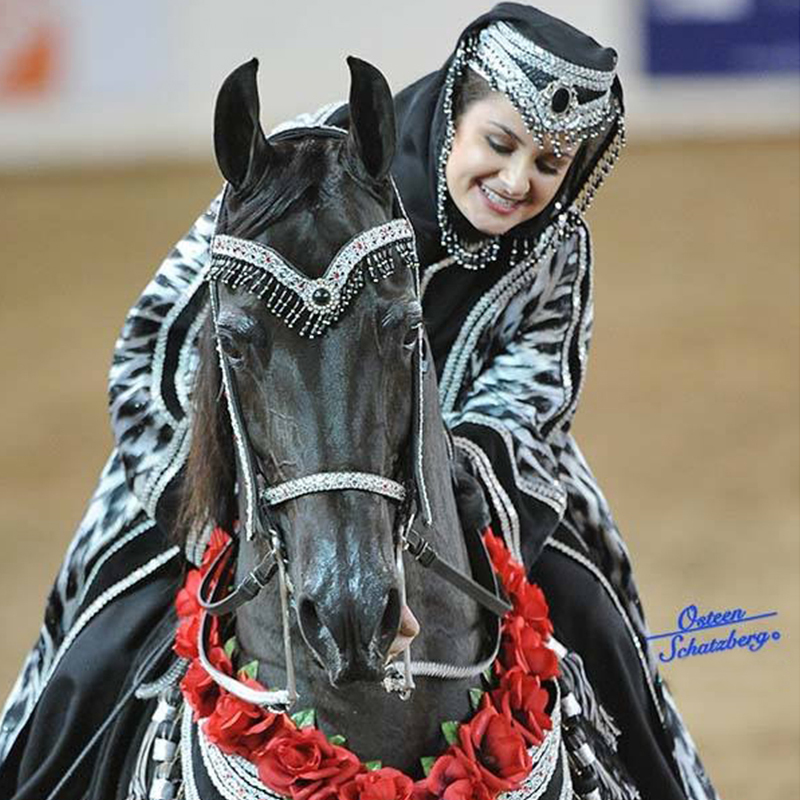 We have been designing and creating Nationals winning Arabian native costumes since 1974. They are imaginative and elegant, from simple to lavish, according to your personal taste and the amount you wish to spend. Second, our company works under two absolute rules: (1) DOES THE COSTUME FUNCTION PERFECTLY, AND (2) IS THE COSTUME BEAUTIFUL. Everything we make has been given rigorous trials in the show ring. It has to work well or we discard it – no matter how beautiful it looks. While you are concentrating on your performance, you may rest assured that every item on your costume is functioning perfectly. 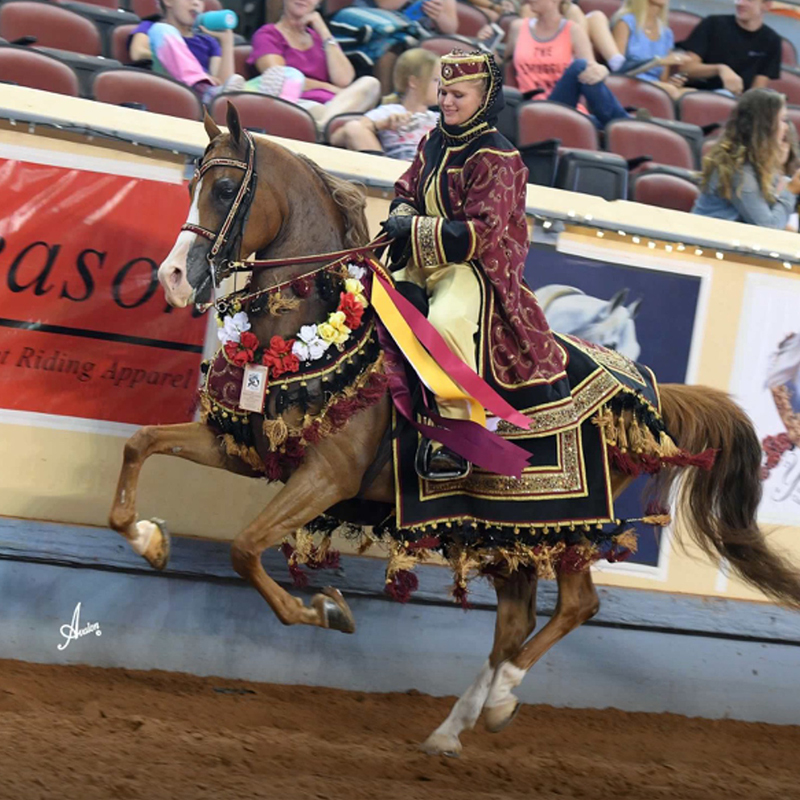 When it comes to the 25% accorded to appointments in the Arabian native costume class, we are confident if we outfit you, you will look elegant and your horse will be shown to their best advantage. So, what do you receive when you purchase a California Arabian Costume? The Bridle: Handmade from leather with webbing sewn underneath to take the pressure off the leather and to prevent to bridle from stretching. The bridle is adjustable for a custom fit to your horse. The Cavason: Beautifully hand-decorated according to the design of the costume. The Snaffle and Curb: Also decorated to coordinate with your custom costume. The Breast Collar: The breast collar is fully lined with naughide to prevent the staining on the top side and is fully adjustable for a secure fit to your horse. The Blanket: The blanket is fully backed with a sturdy upholstery material, making it somewhat “breathable”. A custom made split is made in the blanket to accommodate your saddle, which fits on TOP of the blanket, securing the blanket to the horse. This is also a safety issue should the rider ever lose his or her seat. The Saddle cover: A custom made item to fit your preferred saddle. We offer custom made covers for the dressage, cutback, and western saddles. The Stirrups: Made from English stirrups, leather is fastened on, then decorated with coordinating fabric from the costume, a small detail, but offers a finished look to the overall costume. The Robe: Skillfully hand-crafted, this is the part of the costume that is “showy”. It is fully lined with satin and cut up in the back, which allows the robe to lay beautifully on each side of the horse’s back. The Top, Bottom and Cummerbund: These items are custom made to fit each rider after the buyer has selected their costume. It will be your choice in a complimentary color. The Hat: This is another item that will become the buyer’s choice. We are the original designer of the now famous “Princess” hat, worn by most of today’s show riders. We do offer several other styles according to your preference. When we outfit you, you are ready to ride for those National Championship roses! Please feel free to call or email us regarding costume availability as we sometimes have some in stock for purchase. 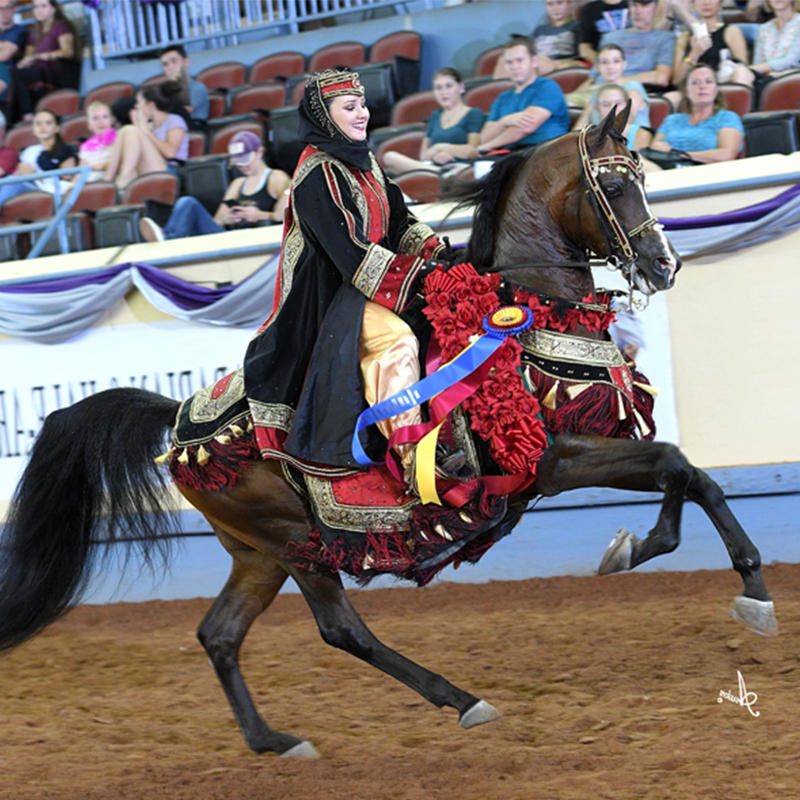 Are You Ready to Design Your Champion Native Arabian Costume? Send us a message using the form below and let’s start making your dreams a reality!